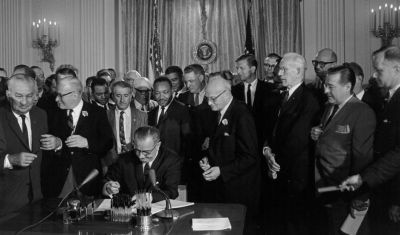 The Civil Rights Act is considered by many historians as one of the most important measures enacted by the U.S. Congress in the 20th Century. President Lyndon B. Johnson led the national effort to pass the Act. On July 2, 1964 he gave a televised address to the nation after signing the measure. His speech appears below. Tne hundred and eighty-eight years ago this week a small band of valiant men began a long struggle for freedom. They pledged their lives, their fortunes, and their sacred honor not only to found a nation, but to forge an ideal of freedom–not only for political independence, but for personal liberty–not only to eliminate foreign rule, but to establish the rule of justice in the affairs of men. Americans of every race and color have died in battle to protect our freedom. Americans of every race and color have worked to build a nation of widening opportunities. Now our generation of Americans has been called on to continue the unending search for justice within our own borders. We believe that all men are entitled to the blessings of liberty. Yet millions are being deprived of those blessings–not because of their own failures, but because of the color of their skin. The reasons are deeply imbedded in history and tradition and the nature of man. We can understand–without rancor or hatred–how this all happened. It does say the only limit to a man’s hope for happiness, and for the future of his children, shall be his own ability. We must not approach the observance and enforcement of this law in a vengeful spirit. Its purpose is not to punish. Its purpose is not to divide, but to end divisions–divisions which have all lasted too long. Its purpose is national, not regional. So tonight I urge every public official, every religious leader, every business and professional man, every workingman, every housewife–I urge every American–to join in this effort to bring justice and hope to all our people–and to bring peace to our land. NOTE: The Civil Rights Act of 1964 is Public Law 88-352 (78 Stat. 241). Public Papers of the Presidents of the United States: Lyndon B. Johnson, 1963-64, Volume II, entry 446, pp. 842-844. Washington, D. C.: Government Printing Office, 1965.